Apple (s aapl) pulled back the curtain on the next iPhone on Tuesday, and it both was and wasn’t what people were expecting. The iPhone 4S is Apple’s newest smartphone, and while it bears a striking similarity to its predecessor, that humble exterior hides a beast. The new iPhone 4s has the same physical dimensions as the iPhone 4, and the same glass-and-steel construction. That’s not really a huge issue; Apple’s industrial design chops still make this the best looking, best feeling phone on the market. And now the good looks are matched by industry-leading internal specs, in the form of a dual-core A5 processor that provides up to two times the performance of the iPhone 4. There’s also a dual-core graphics processor under the hood, providing up to 7x the performance for gaming. The iPhone 4S also has up to 8 hours of talk time, as well as a new antenna system that can switch between available antennas to come up with a maximum performance of 14.4 Mbps down. That’s on par with real-world 4G, claims Apple. It’s also a world phone, so it works with both CDMA and GSM standards. A new camera boosts the iPhone 4S’s photog appeal, with a larger 8-megapixel sensor and a maximum photo output resolution of 3264 x 2448 resolution and better night picture-taking. It achieves this with a CMOS backside illuminated sensor, and 1/3 faster shutter speed. Compared to most point and shoots, it should be able to stand up well, with a f/2.4 aperture and high-end IR filter for better accuracy. Full face-detection and auto-white balance are also now possible. Video recording with the iPhone 4S is now capable of 1080p HD quality capture, with real-time video image stabilization and noise reduction. The iPhone 4S can also do AirPlay Mirroring over Wi-Fi if you have an Apple TV, or via an HDMI adapter if you don’t over a wired connection. Finally, Siri tech (which Apple acquired last year) really did make it into the new iPhone, as rumored. But it isn’t called Assistant; it’s called Siri. The idea is that you can just speak instructions to your phone, or ask it to do things and it will be able to understand you. For example, on stage, Apple demoed asking it what the weather is like, and the phone displayed a weather forecast. Siri can also do things like set your alarm, tell you the time in another city, and provide restaurant recommendations complete with ordered ratings, all in response to commands or questions stated in natural language. Siri can even identify people based on their relationship to you. 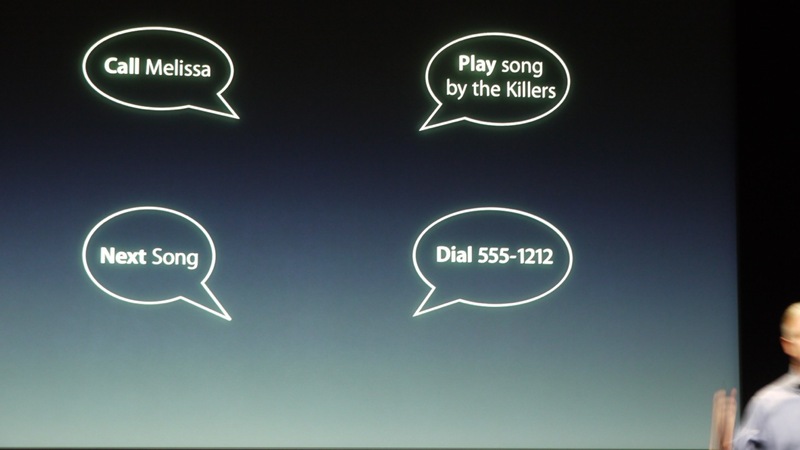 For example, Siri knew who Scott Forstall’s wife was on stage during the demo. The Siri tech has hooks in Wolfram Alpha, Wikipedia and many other apps, too. Looks like it really could potentially make for some awesome lazy-web Q&A. Apple replaced learning today! Another new feature for the iPhone 4S is speech-to-text, which also works through Siri. It’s available anywhere there’s an on-screen keyboard in iOS on the iPhone 4S, and lets you dictate text for entry. It launches with support for English, French and German, and starts as a beta. More languages will be added later on. The iPhone 4S will be available in black and white, in 16 GB for $199, 32 GB for $299 and 64 GB for $399. The iPhone 4 will continue to be available in black and white for just $99 in an 8 GB capacity, and the iPhone 3GS will now be free on contract. The iPhone 4S pre-orders begin on Oct. 7 for an Oct. 14 launch in the U.S., Canada, Australia, the U.K., France, Germany and Japan and it’s coming to AT&T(s t), Verizon(s vz) and Sprint(s s) in the U.S.
Siri is the main reason why the Apple iPhone 4S can hold its own against Google Voice commands. It’s a true-to-life AI in a phone, making my phone brother or sister i can talk to…with eerie social consequences, i surmise in hindsight!!!! Google and their Samsung Nexus sporting Ice cream just don’t get it. It the design and flawless finish, not technology or upgradability or freshness of Open Source [which appeals only to developers] that makes apple hold it own against the coming android Horde. Plus apple is saving the good stuff for next yea 2012AD, when the Apple iPhone 5 will make its debut!! I just purchased a new iphone 4s and I like the phone but have recurring issue with the siri network connection or lack thereof. It worked in the apple store at Bridgeport mall but not at home where i have a wireless comcast network system! anyone else have this problem??? They should charge $250 for the 32gb model and $300 for the 64gb model. Asking an extra $200 is ridiculous just for more hard drive space. I’ll get the 16gb model and just manage my content more often. So……. Apple’s technology just caught up to the Android world? Congrats Apple! As an iPhone 4 owner, I think I’ll wait for the iPhone 5. But it’s really cool for someone who has an older iPhone or ia looking to get an iPhone for the first time. What does everyone think? POLL: What do you think of the new iPhone 4S? A W F U L…..
I’m excited about it, but only because I’ve been stuck with the 3GS for the last year and a half. Probably not worth the upgrading if you’re coming from a 4 already. I’ll be pre-ordering this on Friday with excitement. Larry Page & Geesung Choi must have had a Prime LOL today.